Talking of Office Etiquette, we remember an end number of manners which we are taught from our childhood. But in the case of our workplace, we focus on what we learnt from our management or engineering institutes. We forget the fact that for getting success, office etiquette go parallel with the skills and degrees you have. We have daily scanned on the scale of mannerism by not only the boss, but each and every colleague, yet no one tells what rules we have to follow. Therefore below is the guideline of A-Z of office etiquette or workplace etiquette which everyone can follow to conduct yourself in a respectful and courteous way. 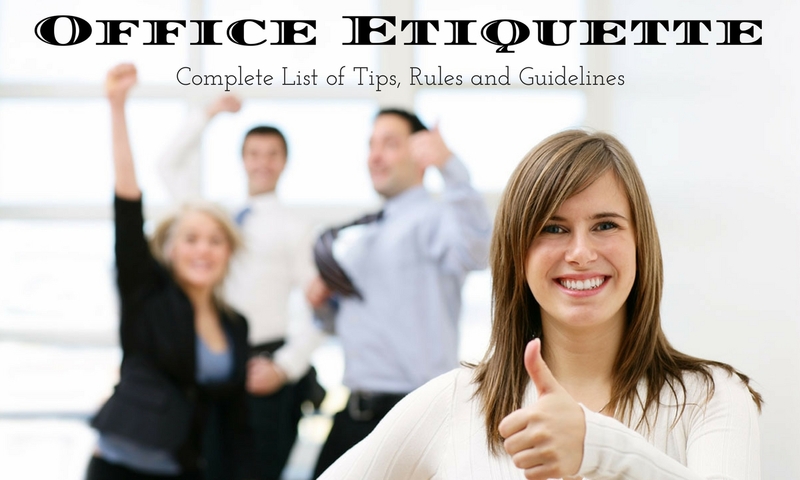 Office Etiquette refers to behaving in a sensible and appropriate manner in the office to leave a positive and everlasting impression. Your inadequate behaviour can challenge others in your workplace and you can become the enemy of your colleagues. Knowing the rules and etiquettes of working in the office can smooth the stumbling blocks of daily interaction and management of work. In simple terms, office etiquette are all about following a piece of advice which is never given by others but you are expected to follow, for getting along with other people in an organizational context. So, to be professional, organized and quick to manage people office etiquettes are vital. Every office has a different set of etiquette policy viz. Casual clothes on Saturday only and others. When you join certain office, be sure to adhere to all the policies communicated to you. In case you are given the list of policies, make sure that you ask to the HR manager or administrative officer about it, so that you don’t stand out in wrong ways. It does not mean that if office etiquettes are not written in black and white, you will not observe it. Following are some unwritten conventions, the Do’s and Don’ts which you need to follow regularly. 1. Do not carry a casual attitude at work. Being off the cuff for any meetings or projects or even your daily work leaves a bad impression on others. You are paid to work and be the asset for the company, not the liability for your colleagues. 2. Never Gawk on other employees workstations or computer screens or cubicles. This would be a kind of interference into their personal space. Always seek permission before entering a cubicle or cabin. 3. Do not keep your cell phone with loud and weird ringtone which can disturb others. Always try to keep your phone on vibrate or mute mode. 4. Checking someone else’s notepad or files or register or laptop without permissions a strict no-no. You are expected to respect others privacy. 5. Criticizing others for their ideas and work or making fun of them are considered bad manners. When you do not like somebody’s idea you may express your opinion without adding any negative emotions and reconcile on a point which is acceptable to all. 6. When you are sick, stay at home. If you come, do not cough and sneeze without keeping your handkerchief on your face as otherwise, you may spread it to others. 7. Popping a chewing gum in front of others is not at all considered cool. You are not in your college, it is your office so behave that way. 8. Never engage in offensive gossip and office politics. The blame games have never brought success to anyone. 9. Do not keep your workstation messy. Your desk/ workstation reflects your thoughts so if it is untidy you are intercepted as a person with ambiguous thoughts. While a clean and tidy desk is considered as a sign of an organized and more responsive employee. 10. Do not scream on your colleague or on your juniors. Using a pitch higher than normal or with the reflection of anger and aggression is not at all allowed and is highly unprofessional. 11. Do not attend a seminar or meeting without a pen and notepad. Meetings usually discuss a long list and remembering all of it is difficult and asking others about those missed points is not at all professional. Nobody will spoon feed you in office. 12. Never assume. Whenever you are required to communicate any information, you cannot assume that telling a few means all will know it. You should mark a mail to all concerned personnel regarding the information. 13. Do not be late in office. It leaves a bad impression about your sincerity. 14. Dress properly and do not keep yourself in rags. 15. Do not dress in a revealing attire. 16. Do not pass any vulgar comments to your colleagues. 17. Do not take the office stationery home. 18. Be a responsible employee and switch off the computer, lights, fans and other machinery attached to your cubicle while leaving even for lunch or tea break. 19. Do not bring your personal work at the office. 20. After using the washroom, do not leave the taps on. Behaving in the way as required by the workplace, not only ensures support from the coworkers but also helps in maintaining the decorum and friendliness in the workspace. Following are some of the rules which need to adhere even if they are not conveyed to you in person. Punctuality does not only enclose the time of your arrival to the office, but it also includes your time in reaching the meeting or conference room in case of meetings, seminars or presentation. You may be engaged in an office work only, but getting late in a meeting is quite unprofessional and echos disrespect towards the project to be discussed. Your dressing should be in sync with the predefined dress code of your workplace. Even if there are no regulations on dressing, dress formally as the dressing is the first impression you leave with anyone. You are the ambassador of your company so your attire should not convey undesirable notions about your office. Heard about the rumour mills? These runs fastest in offices so be safeguarded against running them and engaging in them. In case you overhear some gossip about someone in your office, avoid giving any negative reactions about anyone. However friendly you may be with your colleague always seek his permission before using the things from his desk. The things you may use can be petty, but can end up in tiff sometime if taken without asking. Please, Thank you, You are welcome are the phrases which should be used often. These add politeness to your language and saying anything requesting the other builds more confidence about you unconsciously in the mind of your coworkers. You may have some work to be discussed with your coworker, but hovering around his desk and the personal computer has to refrain. Respect the privacy and stop interrupting him if he is busy with some calls. Talking loudly on the phone or to a colleague and thereby unintentionally broadcasting the talks to others. Taking your personal call on speaker mode on your phone. This can be quite disturbing for others. Having a long personal conversation sitting beside your colleague on your phone. Nobody is interested in knowing the daily chores of your life, this can lead to discomfort for your colleague and he will avoid being with you or around you. Aggressive or Abusive comments made to your colleagues and leave them in an uneasy mental state. Making some or other noise when the person near your workstation is busy taking up a business call. Setting a very disturbing loud ringtone on your phone. Nobody wants to get the whiff of smelly shoes or stinky onion from your mouth or your body odour. Therefore be careful about your actions. Also applying an extra strong perfume can also fall in the same lines of being stinky as this can also be tormenting for people with whom you share workspaces. Now when you are well aware of the Do’s and Don’t’s and rules of the office etiquette, you may be able to picture out how you should behave. 1. You should try to arrive early in office on the regular basis and see how you would be interpreted as a sincere person. You would be often quoted as an example to others which would further boost up your self-confidence and self-esteem. 2. When you join a new company be well prepared about your introductions as first impressions can sometimes leave a permanent positive mark on the people in the office. 3. Remember the names of all the employees in the new workplace, it can easily ward off all the complications in the new place and people may be ready to help you and embrace you as a part. 4. Wave goodbye to the Cluttered Desk which reflects that you are confused and unable to decide. Keeping the desk organized and add a personal flair without over-populating it with personal things. 5. While emailing, your email should be formal and avoid any kind of slang language. Mails are the written proof of your behaviour with the company so be extra-cautious while drafting it. 6. Acknowledge others when the teamwork is appreciated. Nobody hates good work credit so when you do it, you get the same in return. 7. If you come to the office when you are sick, it does not add in your good rapport rather you disgust people around you as others also become vulnerable to the infections you are carrying. 8. You should avoid exiting the office as the clock strikes the closing hour. Office party etiquette works on the simple fact that despite being a social gathering or celebration, you are still under surveillance of your boss and coworkers, so be sober and do not attempt anything which can be the favourite topic of gossip for days and months to come. This can be a great opportunity to establish friendly relationships with people working with you. But remember try keeping your dignity and respect other’s dignity too. Do not forget the pantry area, the kitchen of your office when following the etiquettes. First of all, you should clean the area you soil and leave it tidy for the person who comes after you. Also, do not touch others food kept in the office refrigerator in the kitchen, it can be both very annoying and rude to others. Cell Phone are the most vital part of office etiquette as this is the device which makes us forget everything else. So do not use the cell phone for the personal call unless it is very urgent. Try to keep your conversation as brief as possible. Keep it in mute modes during meetings. Never check your messages and emails on you mobile while a colleague is telling about some sensitive experience or when a meeting is going on. It is quite common to receive telephone calls of grumpy customers. By sticking to the telephone etiquette you may easily calm them down. When some unhappy customer scrams avoid giving your negative comments on that instead listen patiently and let them pour of their anger and then offer a solution to their problem. Coffee etiquettes are simple; never sip a coffee before others. Bring out some great non-business topics to the coffee break so that you are able to refresh them from the stress of workstation. The term ‘etiquette’ means the rules which need to be followed with out questioning. Workplace etiquette is something which is very important and must be followed unconditionally by all the employees working in the organization. A company which follows good work policy and mandates its employees about etiquette will surely achieve success and growth. It helps you transform your company culture and brings in development and values. share work credit between teams and colleagues. Never leave the office too early before time. Do not ever talk about anybody’s personal life on the coffee table it will give a bad impact of your rapport. Please keep in mind that office etiquette is the part and parcel of your work environment. If you neglect it, you could harm your career and spoil your goodwill. When you follow it, you will not leave any stone unturned towards your progress.